where the pulse is centered at time to and has width τ. In 4.1, the time width is equal to one-half of the full width at half maximum (FWHM), τ = 1/2(FWHM). This relationship is highlighted because many experimental studies of pulse-like behavior report the FWHM as the quantitative property of the events under study. where it is now possible to define fs = 1 / (2πτ). This relates Lorentzian pulses to exponential spectra, it remains to find such pulses in the measured time series. Individual pulses must be examined on a single shot basis. Due to their possibly random distribution of time centers any averaging of a data set could exhibit a strong cancellation of pulses. A further difficulty is that the pulse events can be confused with partial cycles of the drift-Alfvén waves. Any removal of the coherent drift-Alfvén mode signal from the time trace can significantly reduce the amplitude of a Lorentzian pulse present in the time trace. While several methods were employed to identify the pulses within thousands of recorded plasma discharges (see Appendix B), a relatively simple “brute force” method was found to be sufficient. By brute force, it is meant that a curve corresponding to a Lorentzian pulse is slid through the data record. Any location that results in a good match is kept as a Lorentzian pulse. One drawback of this method is the long computing time necessary to process large data sets. A major benefit of this method is that it detects pulses without setting an amplitude threshold, thereby allowing even relatively low-amplitude events to be captured. In this method, the functional form of a Lorentzian pulse is fit along the entire time record obtained for a single discharge. The functional form has a time width based on the input value of τ. The resulting time window is slid through the entire data record. Sections of the signal that return a good fit are kept as pulses. A good fit is defined manually after reviewing the results from a limited selection of records. The quality control factors are the standard deviation of the width and the convergence of the fit. After defining a fit pulse, several passes are made through the data set with Lorentzians of different width. In practice, due to the limited variability of the measured widths it is usually sufficient to perform the fitting once. The initial width is set by calculating the exponential decay of the power spectrum and then solving for τ. Figure 4.10 illustrates a Lorentzian pulse featuring positive polarity. These pulses are predominantly observed in the outer regions of the filament. The background fluctuations decrease in amplitude as radial distance from the filament increases. Positive polarity pulses are often easily observed by virtue of their relatively large amplitude. Even so, the same Lorentzian fitting technique, rather than an amplitude threshold, is used to properly identify them as Lorentzian pulses. A slight deviation from a pure Lorentzian is seen in Fig. 4.10. A modified Lorentzian pulse expression will be used in Section 4.5 to better fit this type of pulse. The following section provides a detailed analysis of pulses and spectra for two different axial positions within the same set of plasma discharges. Figure 4.10: (a) Raw Isat data (black) with an overlay of a low-pass filtered result (red). A Lorentzian pulse of positive polarity is indicated by an arrow. (b) Detailed view of the positive polarity pulse (solid red), with a negative polarity Lorentzian fit (dashed black). An example of an Isat pulse with negative polarity is given in Fig. 4.11. Panel (a) shows both raw Isat signal (black) and a low-pass filtered trace (red). 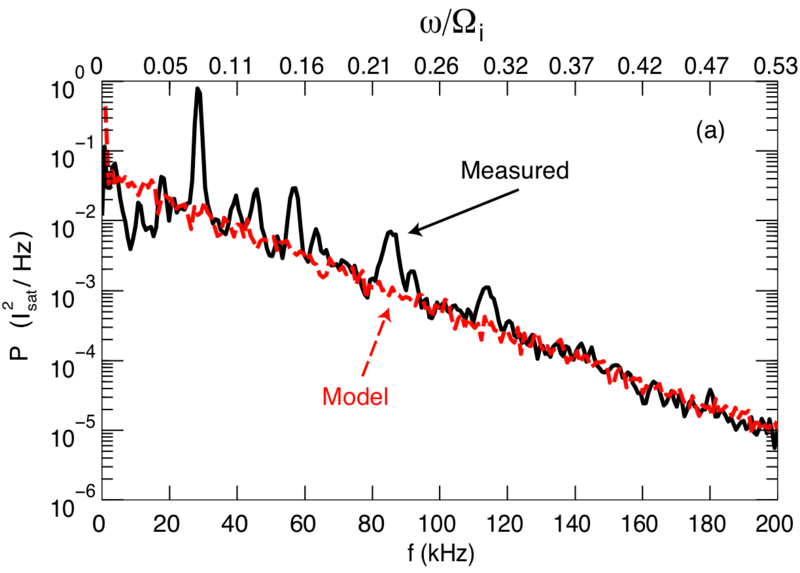 The filtering, while unable to isolate the Lorentzian features, improves the accuracy of the fitting routine by removing higher frequency (> 100 kHz) noise that can reduce the fit quality. The pulse indicated by the arrow in (a) is not particularly large amplitude. Pulses with negative polarity are observed in the center of the filament where the large amplitude thermal wave is also present. Amplitude is therefore an unreliable quantity to use as a method to search for pulses. Figure 4.11(b) provides a closer view of the pulse event (solid red) and shows that it is well represented by a Lorentzian function (dashed black). Deviation from a pure Lorentzian is expected because the pulses are embedded in a stream of other fluctuations from both coherent modes and turbulent effects. Distortions to pulses and slight deviations from pure Lorentzians do not destroy the exponential nature of the resulting power spectrum, as is shown in Sec. 4.5. Figure 4.11: (a) Raw Isat data (black) with an overlay of a low-pass filtered result (red). A Lorentzian pulse of negative polarity is indicated by an arrow. (b) Detailed view of the negative polarity pulse (solid red), with a negative polarity Lorentzian fit (dashed black). In this section a detailed comparison is made between pulse widths calculated from fitting power spectra and those calculated from fitting pulses directly. Figure 4.12 is a plot of the full Isat time traces from the same shot within the data set examined. In this set, two Langmuir probes are placed within the outer region of the radial profile. One probe is positioned at (r,z) = (0.7, 544) cm, while the other is located at (r, z) = (0.5, 192) cm. At these radial positions, the transition to broadband fluctuations occurs very late in time, near t = 11 ms. Power spectra and pulse searches are performed over the time range 10.0 ≤ t ≤ 12.7 ms. The background magnetic field is Bo = 1000 G.
Figure 4.12: Time series of Isat at two different axial positions. The radial position of the trace at z = 544 cm is r = 0.7 cm. The z = 192 cm is at radial position r = 0.5 cm. In Fig. 4.13, pulses detected from the traces of Fig. 4.12 are identified with diamond symbols (all 20 discharges are analyzed for this study). The colors of the diamond markers are the opposite of the trace to clarify the display. The pulse detection technique (see Sec. 4.3) simultaneously identifies positive and negative-polarity pulses by allowing the free variable amplitude to be negative. Along with the positive-polarity and negative-polarity pulses, some false positives are visible within this series. A false positive is indicated by a diamond marker that appears away from an extrema of the measured signal. Ensemble pulse widths are reported with error ranges in order to accommodate the limited number of false events that may be included. Over the complete set of 20 discharges acquired there are 742 events identified at the z = 544 cm position, and 771 events identified at the z = 192 cm position. Figure 4.13: Diamond symbols mark the centers of pulses identified within the Isat traces of Fig. 4.12. Black diamonds are placed on the pulses of the z = 192 cm (red) trace. Red diamonds identify the pulse centers of the z = 544 cm (black) trace. An offset has been added to clarify the display. The characteristic time widths of the identified pulses are given in Table 4.1. The pulse width at the z = 544 cm position is τ = 8.9 ± 2.4 μs, slightly larger than that of the position z = 192 cm, which is τ = 7.8 ± 2.7 μs. The Table also includes the pulse widths as calculated from the power spectra directly, which is presented below. For both positions, the values calculated from these different methods agree to within the measurement uncertainty. Power spectra from both axial positions are shown in Fig. 4.14 and plotted according to their natural logarithm. Panel (a) presents both spectra, showing their similarity. Panel (b) singles out the spectrum from the z = 544 cm position (solid black) and adds a line (dashed blue) representing the exponential fit over the frequency range 30 ≤ f ≤ 60 kHz. This frequency range represents four e-foldings of the power. Spectral behavior at higher frequencies includes noise contributions and is not included in the analysis. Figure 4.14: Power spectra plotted in terms of their natural logarithm. (a) Power spectra from the data set represented in Fig. 4.12. (b) Power spectra from z = 544 cm (solid black) with a fit to the exponential (dashed blue) calculated over the frequency range 30 ≤ f ≤ 60 kHz (the peak near 5 kHz is not part of the fit). The expected pulse time widths calculated from the power spectra are shown in Table 4.1. For the axial position of z = 192 cm the time width is τ = 5.9 μs. At z = 544 cm the calculated time width is τ = 6.5 μs. At both positions, the time widths calculated from power spectra and the measured pulses agree to within the uncertainty of the pulse detection method. Furthermore, during the same plasma discharges there is an agreement between the pulses and power spectra at different axial positions. The pulse detection and the fitting technique yield a time width that is greater than that calculated from fitting power spectra. This is seen in the results presented in Table 4.1 in which the spectral time width calculations are lower than those from the raw measured pulses. Figure 4.15 displays two extracted pulses and their corresponding Lorentzian fits. In Fig. 4.15a it is clear that the measured pulse (solid black) is fit well by a Lorentzian function (dashed red). The time width of this fit pulse is τ = 6.2 μs, compared to the spectral fit value of 6.5 μs. Panel (b) displays a poor fit from the identification analysis. The time width of this fit is τ = 11.7 μs, larger than that of the good fit shown in panel (a). The offset between the pulse centers in Fig. 4.15b is a result of the poor fit. This is the result of numerical issues within the routine. The automated detection of pulses is necessary in order to process the voluminous set of data, though manual review remains the most accurate method of calculating pulse widths. Issues with the detection technique may be reduced through further refinement of the numerical procedure. Figure 4.15: Measured pulses (solid black) and corresponding Lorentzian fits (dashed red) for the position z = 544 cm. (a) A good fit for which the pulse time width is τ = 6.2 μs. (b) A poor fit for which the pulse time width is τ = 11.7 μs. The pulse time width from fitting the power spectrum is τ = 6.5 μs. The treatment of Lorentzian pulses presented thus far assumes that a series of discrete pulses results in an exponential power spectrum. This is shown in Eq. (4.3) for a single Lorentzian pulse. A similar analytic expression is not possible for a series of pulses. The following section treats this issue by way of a model consisting of such a series of Lorentzian pulses. The expression in Eq. (4.3) illustrates that the power spectrum of a single Lorentzian pulse is exponential, but it does not immediately follow that the spectrum of a series of Lorentzians is also exponential. All of the measured spectra are the result of performing Fourier transforms on time records of such length that they contain many Lorentzian pulses. The random distribution of time centers and widths may easily result in a non-exponential spectrum. where the pulses have different amplitudes, Ai, and different widths, tci , while being centered at different times, toi. which is a sum of exponential terms. At this point it is no longer evident that a semi-log representation of the power of (4.5) results in a linear region. A numerical model [Shi, 2008] is used to further this investigation. Figure 4.16 compares the measured spectrum (solid black trace) previously seen in Fig. 1.4 to a model result (dashed red) computed from an ensemble of generated signals. The model accurately reproduces the exponential character of the measured result. Figure 4.16: The power spectrum of Fig. 1.4 (solid black) is compared to an exponential spectrum generated by the model (dashed red). The model accurately reproduces the exponential component of the experimental spectrum, even in the presence of line spectra associated with the drift-Alfvén mode and its harmonics. The model signals are based on Eq. (4.4). Ten Lorentzian pulses (N = 10) are placed into each of 100 time series. Each time series is 1 ms in total length. The center times, toi , are randomly distributed throughout the 1 ms duration. These model traces are normalized in amplitude so the values of Ai are assigned a random distribution between 0.75 and 1.25 to give an average amplitude of unity. Time widths, tci , are distributed between 2.5 and 4.5 μs, consistent with the measured values. The average time width of the model is 〈 tci〉 = 3.5 μs and this value results in the excellent agreement shown in Fig. 4.16. Additionally, this value agrees with the average time width computed from fitting measured pulses, 〈tci,exp〉 = 4.0 μs. Since the analytic shape of the pulses is observed to be Lorentzian, it is natural to direct the study toward determining the generation mechanism that results in such a particular structure. This research is presently led by the theoretical effort presented in Ch. 7 of Shi, . In that thesis, a model of the E×B drift (plasma flow perpendicular to the background magnetic field) behavior is made for the case of two simultaneous drift-Alfvén modes. The model incorporates the combined effects of m=1 and m=6 drift-Alfvén modes. At large amplitude, these waves interact non-linearly and generate non-sinusoidal oscillations in density and temperature. The resulting structures are successfully fit to Lorentzian shapes and reproduce to positive-polarity/negative-polarity behavior that is observed at different radial regions of the experiment. Future work will include efforts to determine the dynamic equation that accurately describes a system that generates Lorentzian pulses, along with corresponding experimental measurements that contribute to this understanding. The temperature filament experiment provides a unique environment in which the level of energy transport transitions from a classical phase into an anomalous phase. The fluctuation power spectra calculated during the anomalous phase exhibit exponential dependency on frequency. These exponential spectra are only observed during times for which the measured time series data features solitary pulses. The pulses are found to fit well to the Lorentzian shape of Eq. 4.1 (deviations from a pure Lorentzian are treated in the following Chapter). Lorentzian pulses are shown to produce exponential spectra, a relationship that allows for the prediction of pulse widths based on the exponential constant measured from a spectrum. In the experiments it is possible to compare a Lorentzian width calculated from a spectrum to that calculated from an ensemble of events. The resultant time widths are found to be in agreement, further supporting the validity of the Lorentzian claim. Finally, it is suggested that this situation is a universal feature of plasma turbulence. A listing of exponential spectra already in the research literature is given in Section 1.3.3. An experiment performed at the LAPD-U involving a controlled density gradient, called the Limiter-Edge Experiment in this thesis, presents an opportunity to test the universality of this process. Similar exponential spectra and accompanying Lorentzian pulses are observed. A comparison between the two experiments is presented in the following Chapter.